The week started with strong weather predictions but fortunately it did not really materialise. The sea conditions were fantastic with excellent visibility and amazing Great White Shark activity! We have also seen seals around the shark boats whilst cage diving was in full flow and one boat was fortunate enough to have 2 predations on seals next to the Shark diving boat, what a bonus! The visibility has been excellent with an average of 8 meters visibility. There have also been some big sharks around with a few large 4.5 meter female sharks cruising around the boats entertaining the people. We did not have a bad sea day all week and some fantastic trips with up to 22 different great white sharks on a single trip! Throughout the week and boats we averaged 14 Great White Sharks per trip! I managed to get out on the sea also on the 12th and this was an amazing day. I got the scare of my life however when my camera (when in the water) was bashed from underneath. To my relief it was a Seal and not a shark! It is a rough place to live if you are a seal as the journey out to the deep to feed is treacherous and the waters highly populated with Great White Sharks. The visibility at Seal Island has been outstanding this week with 7-10 meters visibility. Generally the visibility is low in the winter months but we have experienced perfect conditions. 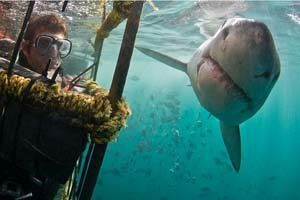 The largest shark attracted to the boat was a whopping 4.8 meters long. The Sardine Run hit full flow this week with some epic dives for some lucky boats. Everyone had great experiences but one boat in particular hit the jackpot with a whopping bait ball of anchovies and over 200 sharks with most of them Bronze Whaler and Dusky Sharks. All of the trawling around searching for bait balls paid off and this ball was definitely worth the days, weeks, years of effort! There have been also multiple sightings of Sailfish feeding on bait-balls which was a real sight to remember! We are having also some excellent encounters with Humpback Whales in the water with some very nice long experiences and fantastic interactions between Whale and divers. The Sardine Run is slowly coming to a close but the action is still hot! Revolution Slider Error: Slider with alias weekinreview-28 not found.